The Oui Title Match had ended today. 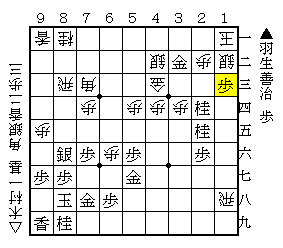 The title holder Habu beat the challenger 8-Dan Kimura, and defended his title with a score of 4-2. There was one draw game. 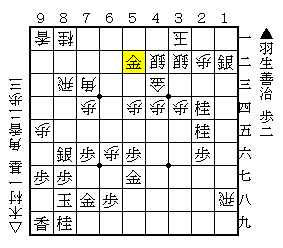 In this position, ▲L*83 Habu played was an impressive move. Sacrificing the lance, and forcing the rook to change the rank, sente is aiming for ending attack. If gote take this lance, sente would attack like ▲Sx21= △Kx ▲N*24 △S*32 ▲S*12 △K-31▲G*52 (Diag.1). Instead of △S*32, if gote plays △S*23, sente can capture the king with ▲S*12 △Sx　▲G*32 △K-11 ▲P*13 (Diag.2). Actually, as ▲G*52 is not threatmate, continuing like △B-64 ▲Nｘ32+ △Kx ▲S*21 △K-31 ▲P*33 △Sx ▲Gx66 (Diag.3), it may be still an equal game. But, gote must pay attention to his king's safety. 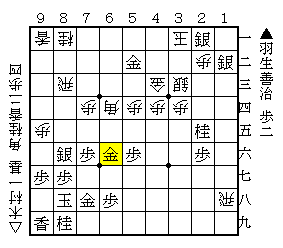 Against ▲L*83, the challenger Kimura judged △R-62 as better. But, Against ▲N*24 at Diag., △S-33 was a losing move because the ending attack from ▲S*12 △K-31 ▲Nx33+ △Gx ▲S*53 occurred. △S*32 was better. In the postgame, Habu said that he wouldn't have any confidence if △S*32 had been played instead of △S-33. Watching this series, I felt that Habu's endgame skill was better than Kimura's, and in the top title game, precise calculation is required in endgame.